Tiago Silva is our new Pasture agronomist. He was born and raised in the region known as Pantanal at the Mato Grosso do Sul in the Brazilian countryside. His family have been beef cattle producers for more than five generations. Following in the footsteps of his ancestors, Tiago’s journey into agriculture began at the University of São Paulo, to study Agronomic Engineering. Tiago became involved in an internship group, focussing on intensive grazing systems research. As part of this, Tiago was involved with experiments ranging from controlling the spittlebug attack on Brachiaria pastures to evaluating nitrogen loss through ammonia volatilisation in tropical pastures. 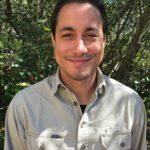 After completing his undergraduate studies, Tiago began a six month internship focussing on animal nutrition and physiology at the University of Queensland (Gatton campus). Following his study in Australia, Tiago received a scholarship to work as a research assistant at Lincoln University in New Zealand. In this role, Tiago evaluated the use of Lucerne/ grass mix or Lucerne as monoculture for sheep production in a grazing trial. Following this work, Tiago returned to Australia to begin PhD studies investigating the effect of nutrition on compensatory growth in cattle at the University of Queensland. Andrew McLean is our new Technical officer. He has a rural background and grew up in the Burnett region in Queensland, living on the family grain, cattle and pig property. Andrew has been employed with DAF for a decade. He started out as a farm hand at the Hermitage Research Station and was involved in all aspects of the station research trials. Then, as a technical officer at the Leslie Research Centre, Andrew was involved in research focussing on chemical use for weed control including contact and residual applications, and more recently, harvest weed seed destruction. Andrew then moved to the DAF research station at Gatton to supervise research trials. 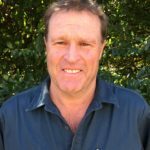 Because of his interest in pastures, accepting this role with the sown pastures team in Toowoomba is a great fit for Andrew! Andrew has a wide range of interests in the rural industry and is looking forward to being involved with this team and learning more about their research projects. His other interests include general construction with metal and wood products and all sports. He likes to spend his spare time with his family.